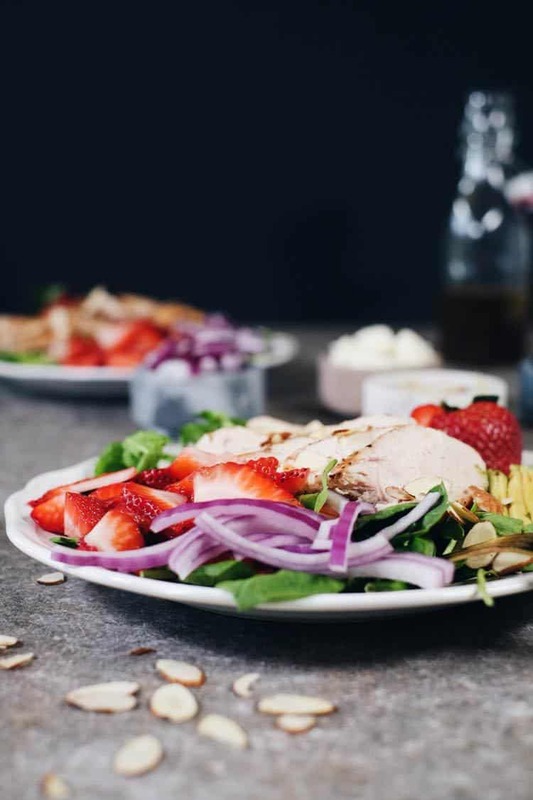 Something about strawberry season just puts a huge smile on my face, and this strawberry chicken salad with a balsamic dressing is the perfect combo of savory and sweet. 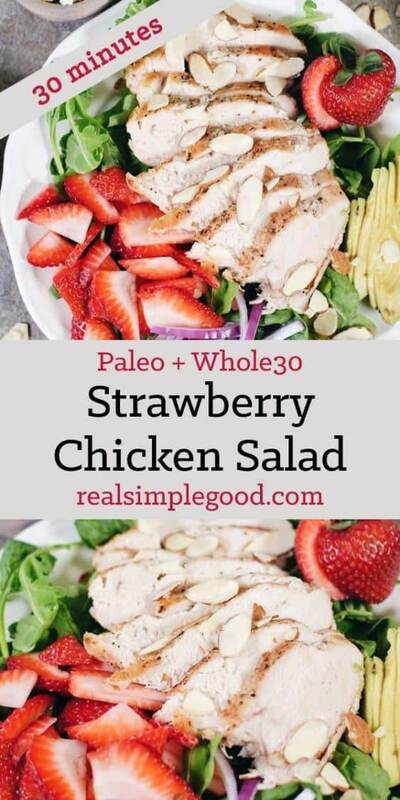 This strawberry chicken salad only takes 30 minutes to make. We are all about quick and easy meals! 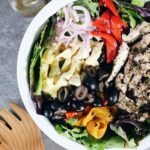 And…what’s even better is that you could make the dressing and chicken over the weekend, and then quickly throw together the rest of the salad right before you eat for lunch or dinner during the busy work week! Meal prep = easy week! 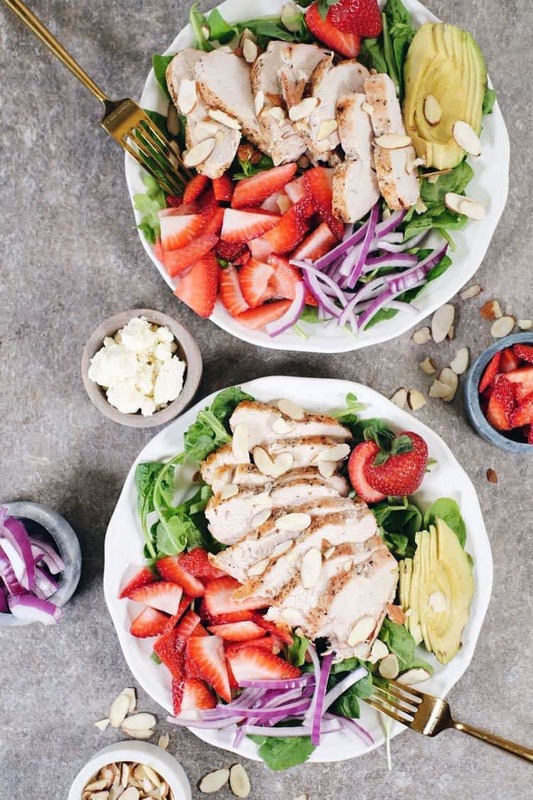 Making the chicken for this salad is a breeze! It’s just simple chicken breast seasoned with generous amounts of salt and pepper and baked in the oven for 20-25 minutes, depending on the size of your chicken breast. Seriously, nothing fancy but the simple flavor of the chicken goes perfectly with the bold flavors of the rest of the salad. 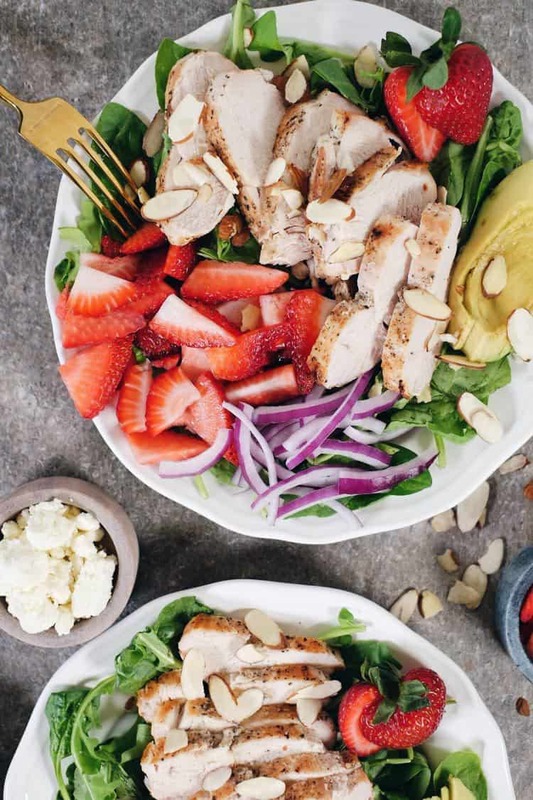 The bold flavors of the rest of the salad are made up of spinach, arugula, strawberries, avocado and optional feta cheese. All of the flavors go so well together and complement one another. 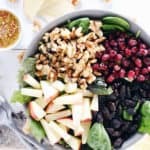 Then, it’s topped with sliced almonds for texture and crunch and a balsamic dressing. The dressing is pretty simple and gets its zing from the balsamic and Dijon mustard. We added olive oil for good fats and seasoned it simply with salt and pepper. It’s super simple, but the perfect complement to the other bold flavors. 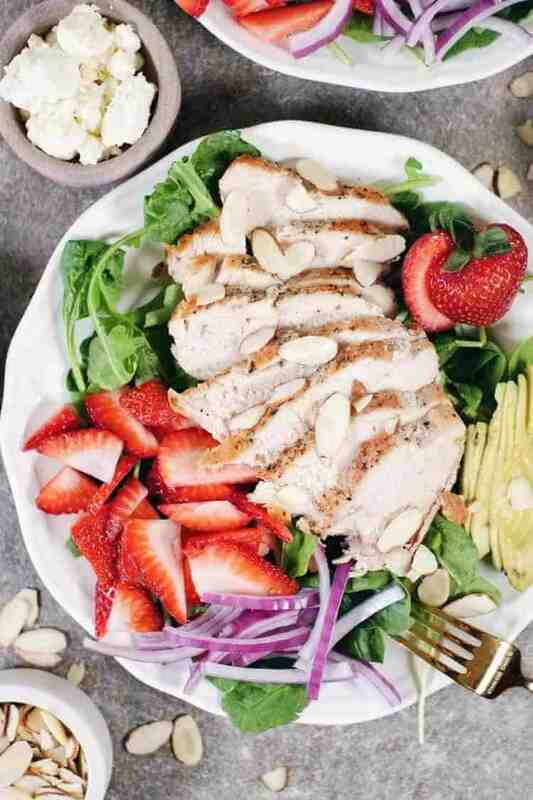 Strawberries with balsamic is one of my favorite combos! 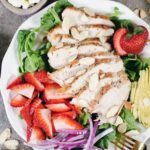 Plan this one for next week while strawberries are fresh and in season! 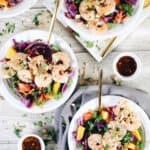 You can even prep most of it over the weekend and then throw it all together for a breezy lunch or dinner! Let us know how it goes by leaving a comment below. Also, take a photo and tag us on Instagram @realsimplegood, so we can check it out! In just 30 minutes this savory and sweet salad will be on the table! It's full of flavor and super easy to make! Preheat oven to 450° Fahrenheit and lightly grease a baking pan with avocado oil. Season chicken on both sides with salt and pepper. Place chicken on the baking pan. Place in oven to cook for 20-25 minutes, or until the chicken is cooked completely through and 165 degrees in the center. While the chicken is cooking. Prepare dressing by combining dressing ingredients in a small bowl or jar and mixing well. Cut up strawberries, onion and avocados. Place spinach and arugula in a large bowl and add the strawberries and red onion. Toss with dressing and mix well. When the chicken is finished, remove from oven and allow to cool for 5 minutes then slice into small strips. 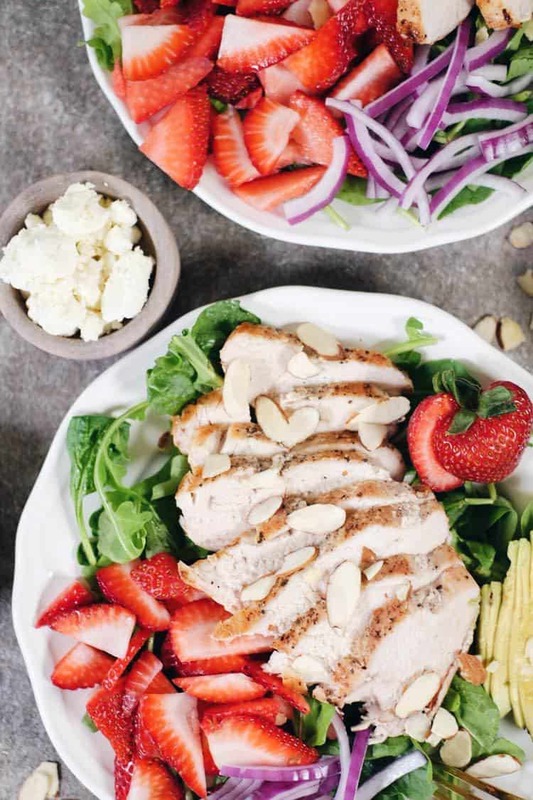 Serve salad topped with chicken, avocado, sliced almonds and cheese (optional). Enjoy. 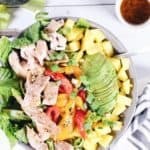 IF YOU LIKE THIS SALAD, YOU MIGHT LIKE THESE OTHER SALAD RECIPES TOO!